Produced from 1926-March 1942 exclusively for Sears at a price of 39 cents. Designed as an expensive label to complement the Silvertone, Supertone, and Challenge labels. Pressed by Regal Record Company from 1926-June 1929 and then pressed American Record Company (ARC) from 1929 onward. When ARC took over the pressing, they dropped all mention of Sears on the record. The trumpeters were removed in 1934 and replaced by a simplified shield design. When ARC was bought by CBS in 1938, CBS kept the Conqueror label and packaged the label in sets. In the label’s final days (1938-1942) the Conqueror’s shield appeared as black rather than red. Many of Conqueror’s artists used pseudonyms and because Sears was at various times contracting three different record companies to produce music and those record companies often drew from the same catalogs or master-records there is considerable duplication of music. However, some records may be alternate takes and records produced after the 1938 acquisitive tended to be artists from the CBS catalogs. Music Genres: Country, Jazz, Blues, Swing, Pop. Pre-WW2 Label: Red background with decorative rim and trumpeters. 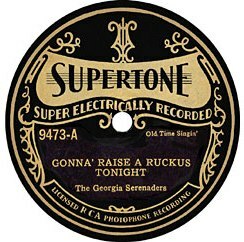 Conqueror Record Label: 1929-1934. Note the absence of Sears. May be in red or orange. This indicates it was made by ARC. From 1934-1938 the record label has a basic red shield without the trumpeters. Record Label: 1934-1938. Red color with shield. Notice the lack of trumpeters. 1941-1945 Label: After being bought by CBS, the label switched to being all black. 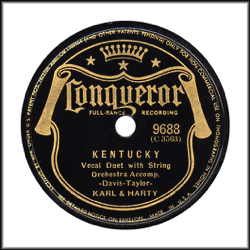 Conqueror Record Label: 1938-1942. Black color with shield. Numbers from start to 1945: 7000-10000. Numbers 7254-7277 are race and country artists. 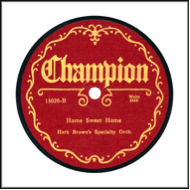 Notes: Famous artists found on this record label include: Big Bill Broonzy, Lucille Bogan (aka: Bessie Jackson), Amos Easton aka Bumble Bee Slim, Lil Johnson, and Memphis Minnie. Other important artists include Louis Armstrong , Cab Calloway, and Gene Autry. Listen to Dear Old Western Skies by Gene Autry on a 1934 Conqueror Record. Listen to My Gage is going up by Memphis Minnie on a Conqueror Record most likely from the early 1930s. Rust, Brian. The American Record Label Book. Arlington House Publishers, NY. 1978. Sutton, Nauck. American Record Labels and Companies: An Encyclopedia (1891-1943). Mainspring Press, CO.2000. 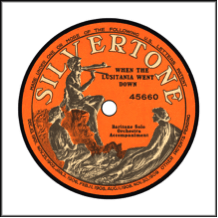 Click the link to visit Supertone Records page as part of the 78 Records Project for World War II Reenactors.